The differences between sexual and asexual reproduction, the structure of DNA and its role in making proteins, mutations and their effects and how characteristics are inherited.
. The protein produced depends on the template used, and if this sequence changes a different protein will be made. to add to the growing protein in the correct order. There are only about 20 different naturally-occurring amino acids. has hundreds, or even thousands, of amino acids joined together in a unique sequence. It is then folded into the correct unique shape. This is very important, as it allows the protein to do its job. Some proteins are enzymes, others are hormones and others form structures within the body, such as collagen. Each of these proteins needs a different shape. 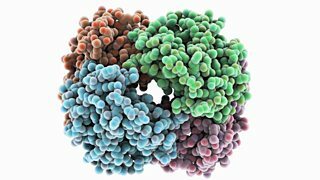 Cells express their genes by converting the genetic message into protein. This process of protein synthesis occurs in two stages - transcription and translation. When a gene is to be expressed, the base sequence of DNA is copied or transcribed into mRNA (messenger RNA). This process takes place in the nucleus and occurs in a series of stages. The two strands of the DNA helix are unzipped by breaking of the weak Hydrogen bonds between base pairs. This unwinding of the helix is caused by an enzyme (helicase enzyme). The enzyme RNA polymerase attaches to the DNA in a non-coding region just before the gene. Note - RNA nucleotides contain the same bases as DNA, except that T is replaced by U. U base pairs with A. Because the opposite base bonds with the exposed DNA bases, the strand of mRNA is an opposite copy of the DNA strand (except that U replaces T). We call this a complementary copy. The newly formed strand of mRNA is now ready to leave the nucleus and travel to the ribosome. The mRNA strand travels through the cytoplasm and attaches to the ribosome. The strand passes though the ribosome. For every three mRNA bases the ribosome lines up one complementary molecule of tRNA. We call every three bases a codon. tRNA molecules transport specific amino acids to the ribosome which they leave behind shortly after lining up opposite the DNA. Because there are three mRNA bases for each tRNA molecule, we call this the triplet code. Used tRNA molecules exit the ribosome and collect another specific amino acid. A chain of several hundred amino acids in the correct order according to the original DNA is then made. This is called a polypeptide. After translation, the polypeptide is finally folded into the correct shape and becomes a protein. Peptide bonds form between the adjacent amino acids to finalise the structure.